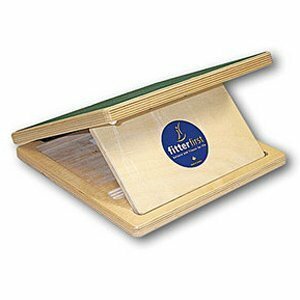 FitterFirst Slant Board Pro (large version) is the 14 inch calf and ankle stretching board to help improve your flexibility and decrease tightness, with three angles- strut settings from very steep to medium to slightly steep (42, 38 and 26 degrees of adjustable height) depending on your flexibility. It is very simple to use, mostly with both of your legs and opens up just like a laptop and when you step on it just use a wall in front of you for stability or by leaning your back against the wall behind. You can also do lunges by stretching one of your legs, by positioning your feet on the Slant Board and moving your bodyweight over your feet, you can simply relax your calf muscles, improve your tight calf or stretch achilles tendons if you have an injury and is a good tool for ankle rehabilitation and great for plantar fasciitis with only a few minutes a day in the morning. It is suitable for customers of any age- young or old, those with tendon injuries or random people that want to stretch. Fitter Slant Board is quite a reliable and durable unit that gives you the impression that it will last quite some time even though it looks a little expensive for what it appears to be at first glance as it is made of very good quality wood which also makes it a little heavy. And even with bare feet or with shoes the grip is really good on the top surface with rough texture so your feet will not slide down and it also has great large circle of quality soft non-skid rubber at the bottom so there will be no slippage even when you use it on very hard floors and put a lot of pressure on the board. You have two size options but the smaller 11 inch one will not be good for men with bigger feet, you’re better off going with this 14 inch Pro version. It is not a very big unit but also folds easily to be stored away in a convenient spot (shipping weight is 7.4 pounds). It works really well with the adjustable angles, feels very sturdy- is very well built, may be larger than many people’s feet but that is perfectly fine (you don’t want smaller than your feet) and the only negative we can point out is the price and quite frankly this thing is well worthy of its somewhat higher price tag.